Bathing has been a luxury since the dawn of time but it doesn't need to be an expensive or hard to earn pleasure. We bring the best in bathing straight into your home with our range of freestanding, straight, shower baths and a choice of luxurious whirlpool baths. There really is something for everyone, whether you’re you just need a quick soak, or want to lie back and read a book amongst the bubbles. You can be sure to find the perfect bath to suit your setting which you will enjoy and relax in after a long day. ###H2###Bathtubs for Sale###/H2### At Bathroom Takeaway, we understand that a bathtub is the heart of any bathroom. Whether it’s used to relax after a long day at work, or for use in a busy family bathroom, the bath you choose has to be as unique as the person using it. ###BR######BR### However, with such a wide variety and numerous requirements, choosing the right bath can be a complicated process. It is important that you choose a bath that will still be practical years down the line, but one that will also remain stylish. That’s why Bathroom Takeaway offers such a wide selection of high quality, stylish baths at a reasonable price. From l-shaped corner baths to walk in tubs, free-standing roll tops and whirlpool baths, whatever your bathing requirements, we have the ideal solution for you. ###BR######BR### As well as being extremely stylish, our bathtubs are also very practical and are manufactured using the highest quality materials. They come complete with a 10 Year ‘Fit & Forget’ promise, which guarantees that your bath will last for years to come and with everyday low prices, you can also be sure to find the perfect bathtub, without breaking the bank. ###BR######BR### ###H3###Choosing a bathtub###/H3### When designing your bathroom makeover, a number of considerations need to be taken into account, including space, colour scheme and style. The modern bathroom is no longer just a practical space, it’s a haven, perfect for unwinding, which is why it is so important to get your bathroom and more importantly your bathtub right. ###BR######BR### There are so many styles, sizes and variations of tubs, its difficult to know which one is best for you and your space. That’s why, at Bathroom Takeaway, our vast range of bathtubs, come in different specifications and sizes, so there will always be a solution for your room. ###BR######BR### For those with ample bathroom space, our range of freestanding baths offer style and provide a perfect focal point for your bathroom. Stunningly crafted from high quality materials, the freestanding bath collection at Bathroom Takeaway allows you to create the bathroom of your dreams, whilst remaining practical. 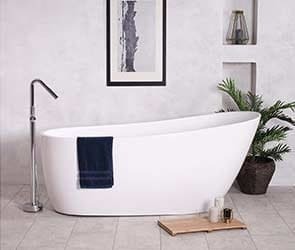 Depending on your chosen bathroom design, our freestanding bathtub range features traditional, intricately detailed baths, or for a more modern bathroom space, we offer a range of minimalistic, angular bathtub designs. 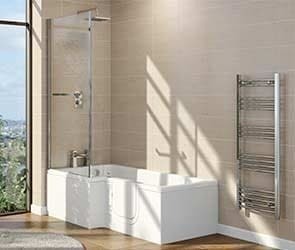 The hardest part will be choosing between a stunning freestanding tub, or a more curvaceous freestanding slipper bath. We also offer a range of small freestanding baths, for those who still want the luxury of a freestanding bath but are struggling for the space. ###BR######BR### Our ranges of straight, double or single ended baths are our most popular bath designs. The perfectly traditional style bath is ideal for any type of bathroom. With a wide range of sizes, our straight baths are the perfect space saving alternative to a freestanding bath. For added luxury, we have a range of straight whirlpool baths that will bring a spa-like feel to your bathroom, whilst simultaneously offering great entertainment for children at bath time. The jacuzzi baths are also extremely therapeutic and surprisingly affordable. ###BR######BR### For more functional smaller bathrooms our range of modern shower baths are extremely popular and provide the ideal combination for those who prefer the practicality of a shower and the luxury of a bath. Ideal in a family bathroom, our range of L & P shaped baths are available in various lengths, in either a left or right-handed design. Therefore, dependent on the size and style of your bathroom, you can be sure you get the perfect tub for your bathroom space. ###BR######BR### Walk in bathtubs are our range of easy access baths, created especially for those with limited mobility. Our easy access baths come in various sizes, as either deep soak walk in baths or easy access P & L shaped baths. So, dependent on the style of the bathroom and mobility of the individual, you can choose a perfectly safe and modern bath. 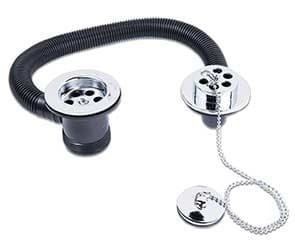 ###BR######BR### ###H3###Bath Accessories###/H3### As well as offering a wide range of bathtubs, Bathroom Takeaway offer all of the accessories to go with them. We offer a stunning range of traditional and modern bath taps, complete with a chrome finish. From pillar taps to mixer and waterfall taps, they will perfectly accompany your chosen bath. ###BR######BR### Additionally, we offer a range of walnut, grey, white and tongue and groove bath panels, so you can further customise your bathtub to match your personal style and the overall design of your bathroom suite. Whether you wish to create a traditional or contemporary look for your bath, our shower bath panels are well designed and durable. ###BR######BR### Bathroom Takeaway also offers a range of easy to clean, glass bath shower screens that will help protect the rest of your bathroom, without ruining the style of your bathroom suite. ###BR######BR### ###H3###Product Guarantee###/H3### The bathtubs here at Bathroom Takeaway are manufactured from the highest quality materials, in order to ensure they are strong, durable, resistant to scratches and in turn, built to last. Acrylic is a one of the most widely used bathtub material, thanks to its ability to resist wear and tear. With this in mind, it is our most popular bath material. We are so confident in the craftmanship of our baths and the materials used, we offer a 10 year ‘Fit & Forget’ guarantee on all of our bath products, so you can be sure when you purchase from Bathroom Takeaway, you are covered under the unlikely event that your bath fails to meet its requirements in terms of usability. ###BR######BR### ###H3###Price Promise###/H3### Here at Bathroom Takeaway, we prefer to offer our customers everyday low prices, rather than seasonal sales. This allows us to provide you with the best prices, all year round and also means that you don’t have to wait for a sale in order to get the bath of your dreams. As well as offering low prices every day, all year round, all of our products are also eligible for free delivery when you spend over £349. ###BR######BR### With such a wide range of bathtubs available at reasonable prices, we are confident that you will find the bath you are looking for online, at Bathroom Takeaway.